Usually, you will need to print a menu for your reception so that your guests know the food that is going to be served. 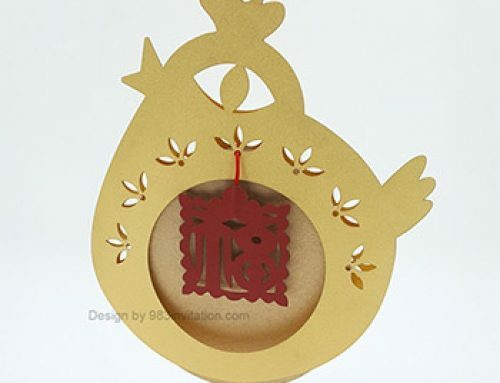 It will be perfect if the design matches your invitation. This wedding menu is designed with invitation design “Be Together“. A Square size wedding menu with the guest names printed on it. It can also be used as place card :). Of course, matching the invitation design is not a must. 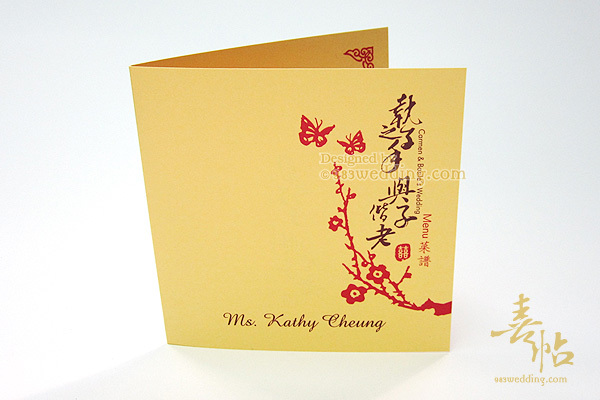 You can also use this menu design even if you have a different wedding card design. Since this wedding menu will be a part of the whole stationery set, the design of it will follow the original “Be Together” design. You can see the cherry blossoms, butterflies and also the phrase “執子之手 與子偕老”. 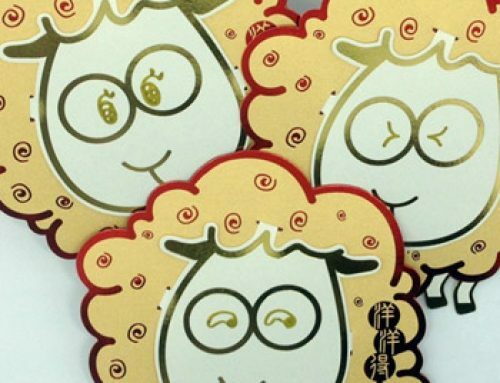 Of course, the double happiness symbol will also be printed on this menu. 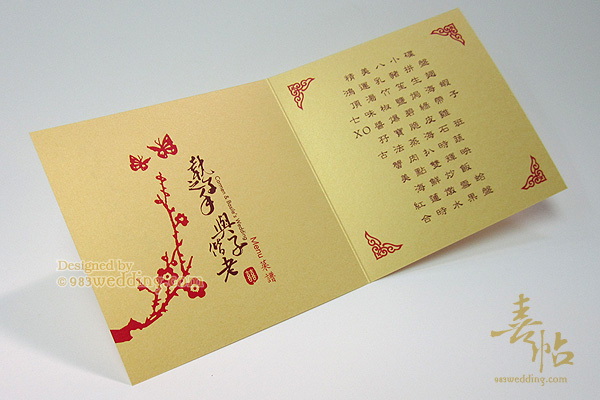 In short, it is a wedding menu in modern Chinese style. 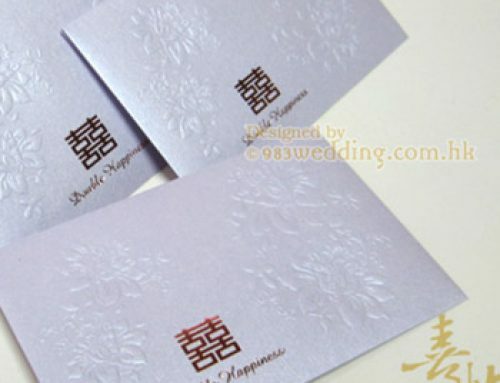 In order to tell your guests that this is the menu of the reception, the words “Menu”, and “菜譜” (which means “menu”) in Chinese, will also be printed on the cover of it. 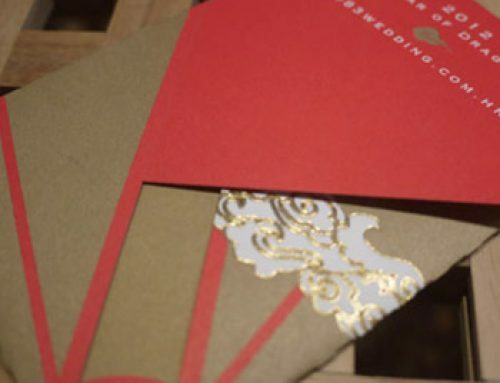 All the main graphic elements you can find from the original wedding invitation design will appear on the inside of the menu. Without any surprise, the courses will also be printed on the menu. A Chinese style red color “border” is printed on the four corners of the right panel of the menu, with the courses printed inside this border. What is special about this wedding menu is that we will help you to individualize it. Individual guest names will be printed on it. This means that every guest will have his / her own menu. As a result, we regard this menu as a 2-in-1 design. It is possible to use it as the place card at the same time. You do not need to prepare place cards separately in this case. If you do not want to make it the place card, we can also provide you the menus without guest names. 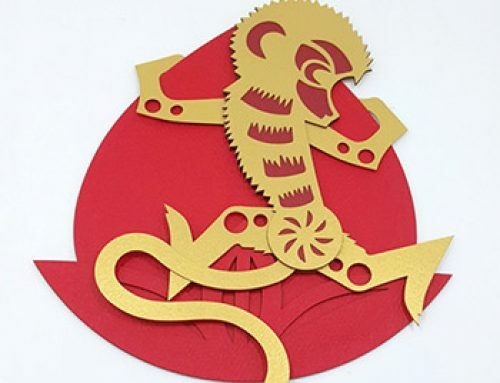 The design of this menu is mainly for a modern Chinese style reception. 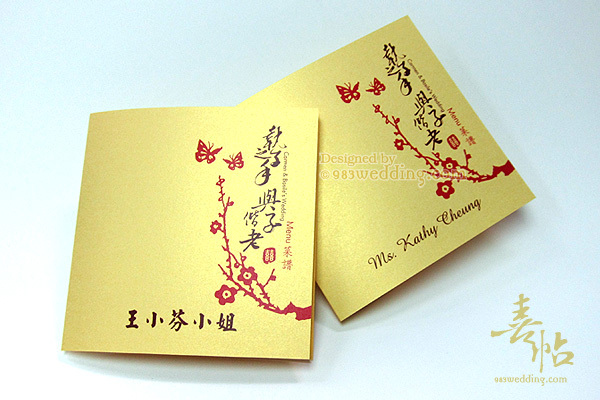 As a result, it will look a bit more Chinese when it is compared with the original wedding invitation design. We can also keep the original orange color design. You can contact us so that we can discuss the design. Cover with full color printing on BOTH sides.